Let’s talk about the remarkable resurgence of Dungeons and Dragons over that last couple of years. With the release of Fifth Edition (AKA 5E), a new D&D clothing line, it’s imagery used in the immensely popular show Strange Things, and issues of a D&D comic from IDW (and a Rick and Morty crossover); the D&D brand has become cool and interesting to the world in general and not just for nerdlingers like myself. Much in the same way that the D20 system was very open-ended and lent itself to people creating their own worlds and adventures 5E has done a lot of the same things. We are starting to see a new crop of creative projects that can be used in your personal D&D campaigns. Enter Rolled and Told, this new line of books from the people at Lion Forge and Quillion. 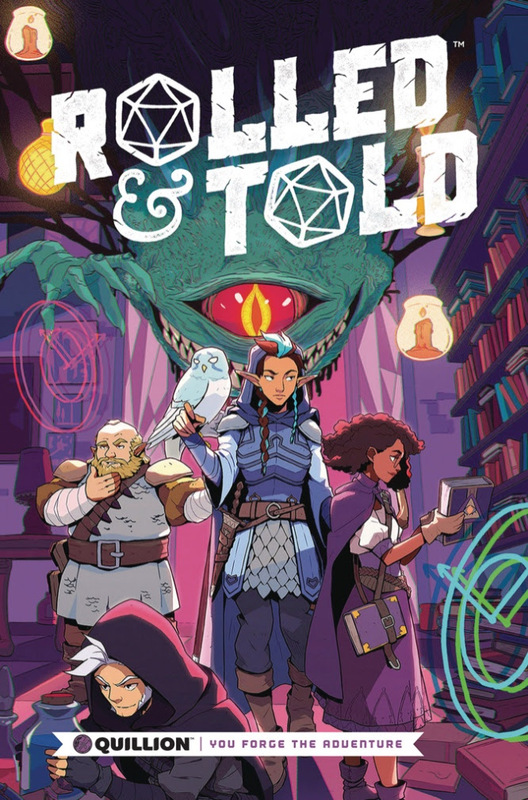 Rolled and Told is a single adventure wrapped up in a comic book. By using comic book pages and art to create the framework for an adventure, as well as having maps, adventure hooks and even tips and tricks on how to create better adventures, this foray into the world of comics and Dungeons and Dragons is really pretty brilliant. Issue 3 revolves around a school names Varacadabara that has lost control of time and space and the monsters that they are hiding inside. As adventurers, you are tasked with going into the school to rescue the students that are trapped inside. Time and space shift and warp as you make your way through the school, new creatures confront you and there is plenty of mystery to be solved. It is a good stand-alone adventure that can be fit into any campaign setting, and as long as you have the core rulebooks for the game you are good to go. The best part of any supplement like this is that there are new monsters, spells, and concepts that can be spread out through the rest of your campaign to flesh out your world even more. This 66-page book from Lion Forge is a perfect example of what makes D&D great. You can create your own worlds and adventures, but when you don’t have the time to make something new for your group there is always something like this that you can lean into and rely on. So if you are a fan of the old Dungeon magazines, or just have a campaign that needs a little fleshed out: Rolled and Told is the book for you.